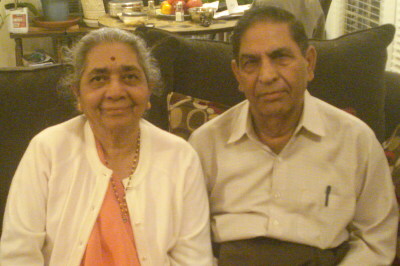 Gangadhar Sharma and Saroj Sharma came to Raleigh in 1972. They founded Hindu Society of North Carolina in 1976. That put a foundation for a vibrant Indian community in Triangle area. The HSNC now has 1,100 members, 15 acres of land and 2 full time priests. It was my pleasure to meet them and discuss with them about HSNC and their involvement with Indian community. Satish: Please tell me about what made you to come to Triangle? Mr. Sharma: In 1960, I came to Canada for research at McGill University in Montreal. I completed my MS and PhD in Biology. I came to Raleigh in 1972 with wife Saroj Sharma and 5 children. I joined state government in 1974 and I am with them ever since. I currently teach blind students in department of human resources. Satish: Tell me about what inspired you to form HSNC? Mrs. Sharma: We started Satya Narayana Katha at our home in Raleigh. We invited friends and family. It became a monthly event. It grew big and we shifted to rental facilities. In September, 1976, we formed the Hindu Society with $2 as membership fees. The society bought a church in 1980 since it was difficult to rent facilities. We purchased 7 acres of land for $70,000 in 1984. The church was sold in 1985. The hall was built in 2000 to encourage the cultural activities. I and my husband (Sharmaji) performed daily pooja from 2000 to 2003. We wanted to save money for buildings instead of hiring a priest and paying them. Kids who are born in US ask ‘who is Krishna?’, ‘who is Hanumaan?’ We should help them learn our culture. We want them to feel that they belong to a great religion and a vibrant community. We want temple to be a place to worship and meet friends. God is the true friend and we pray when we feel happy and we pray we feel sorrow. Satish: Why was it called Hindu Society? Mr. Sharma: We had a unique concept of having all gods under one roof. ‘God is one’. Every god says ‘Do good, be good and help the needy’. These are basic rules for a fulfilling life. We had a very democratic way of choosing the idols and their position. Radha Krishna had the most number of votes and we put Radha Krishna idol in the center. Satish: What was involved in building Hindu Society? Mrs. Sharma: Government was very co-operative. We requested the land and mentioned that it is to teach culture and religion. We were the only Hindu organization in triangle and it was easier. Satish: What would you like to do more for HSNC? Mrs. Sharma: I would like to grow the organization further. Build more class rooms for both religious and cultural purpose. Extend temple hours and have 2 more priests. Help people to feel homely and build a supporting system for the community. Satish: What should new comers to Triangle area should do? Mr. & Mrs. Sharma: Visit the temple, become a member of HSNC and volunteer for the community events. Enroll their children for the classes. Satish: How can they become the members? Mr. and Mrs. Sharma live in Morrisville. They have 5 children, 10 grand children and one great grandchild. Their son Alok Sharma lives in Cary with wife and 2 kids. Others live in various places in US. During the discussion, I was served with hot cup of Chai, Kachori and Gajar ka halva. I was impressed by their humble nature.